Writing to Don Smith in August 1944, Sydney Pate put into words what so many at the time and since have wondered. Just what was it that caused the loss of Lancaster LM475 over Lille? Mr Pate put into words what is still puzzling, even today. When we first met Phil Smith in 1996 we asked him what he remembered. His answer? Very little. Everything, he said, went hot, dry and red – and suddenly there was no aeroplane around him anymore. So he pulled his ripcord and parachuted to the ground. Even the only man who survived the destruction of LM475 never knew for sure what caused his aircraft to crash. So what hope have we, 65 years later, of finding a definitive answer? I’ll happily concede that, without wreckage to examine and without any known eyewitnesses, it is highly unlikely, if not impossible, that I will ever be able to nail down a probable cause with any degree of certainty. But there is some written evidence that I can use to look at a number of theories. At this stage in my research I have not actually studied these closely. I am simply putting the theories out there so I can start thinking about them in more detail in the future. This is by no means intended to be a comprehensive list of all possible causes for the loss of LM475. I may even edit this post to add more if I think of any plausible ideas in the near future. Though there remains no physical evidence in existence – only a single propeller blade is left of the wreck of the actual aircraft – there is written evidence that lends support to some of these theories. I don’t think that enough evidence exists to be definitive, but I think it would be an interesting exercise to at least try and produce a plausible, probable cause. For an Australian, seeing even one Lancaster is something of an achievement. There are only two in the entire country – and they’re separated by some 2000 miles. So while I was in the UK in June 2010, managing to visit no less than three in about four days was pretty special. They were all around London – R5868 ‘S-Sugar’ at Hendon, DV372 ‘Old Fred’ at the Imperial War Museum, and PA474 ‘City of Lincoln’ at Biggin Hill. Each one inspired some sort of feeling, but not entirely as one might have expected. 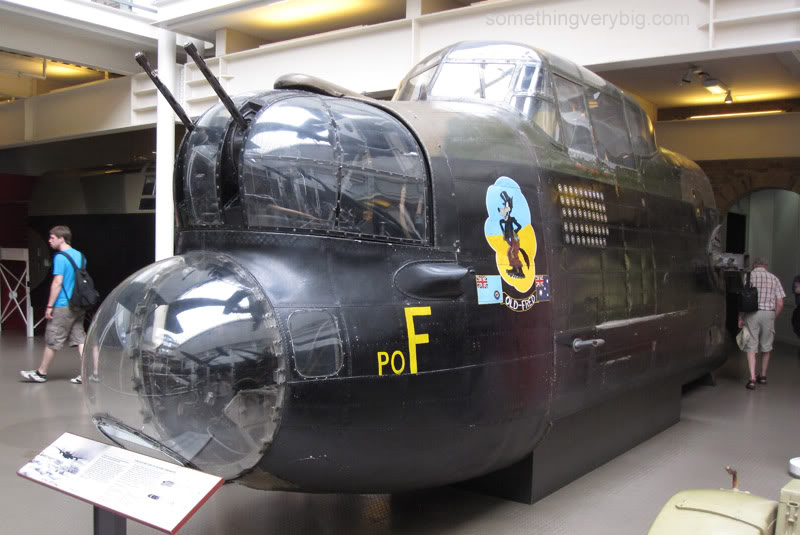 This is of course the Lancaster that was immortalised by navigator Arnold Easton’s book ‘We Flew Old Fred – The Fox’. It has a personal connection for me as well, appearing at least once in the logbook of S/Ldr DPS (Phil) Smith, who led my great uncle Jack’s 467 Sqn crew. Jack himself was not on this operation but the rest of the crew were. 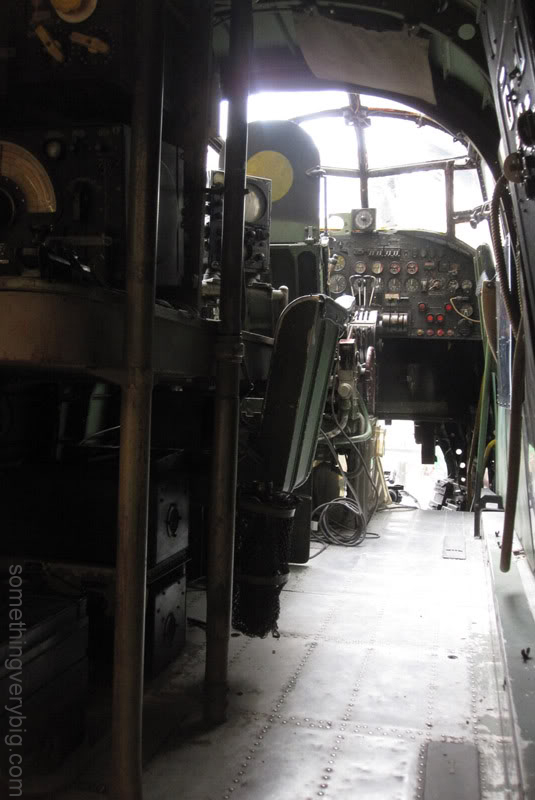 I’m told that, except for a great big sheet of perspex over the flight engineer’s panel, the cockpit appears more or less untouched from the way it looked at the end of the war. There’s another great big sheet of perspex across the end that seals off the inside from the sweaty hands of the thousands of school children who were visiting at the same time that I was. It also, of course, carries out the same protective function against slightly emotional relatives of bomber aircrew… like me. I was pressed up against the plastic for some time, gazing at a bucket seat that Phil Smith sat in… a navigator’s desk like those Jack Purcell worked at… the knobs on the radio sets that wireless op Dale Johnston fiddled with. Half the aeroplane is missing, but standing there looking forward it wasn’t hard to imagine the three of them, plus the hulking figure of Ken Tabor at the flight engineer’s station (without the perspex) and, beyond those yellow railings, right up the front in the big bulbous blister, bomb aimer Jerry Parker. The chatter of the schoolchildren became the drone of four Merlins as the Lancaster flew through the night. There was definitely a connection here. S-Sugar is an aeroplane that should evoke similar feelings. It’s certainly an aeroplane that was on squadron at the same time that my great uncle and his crew were. In fact I can almost imagine their anticipation at the prospect of a party in the mess when Sugar approached its 100th operation. Sadly, they were not to enjoy any celebrations, being shot down the night before Sugar chalked up its ‘Ton’. But as I approached the aeroplane I saw tape blocking off one side. 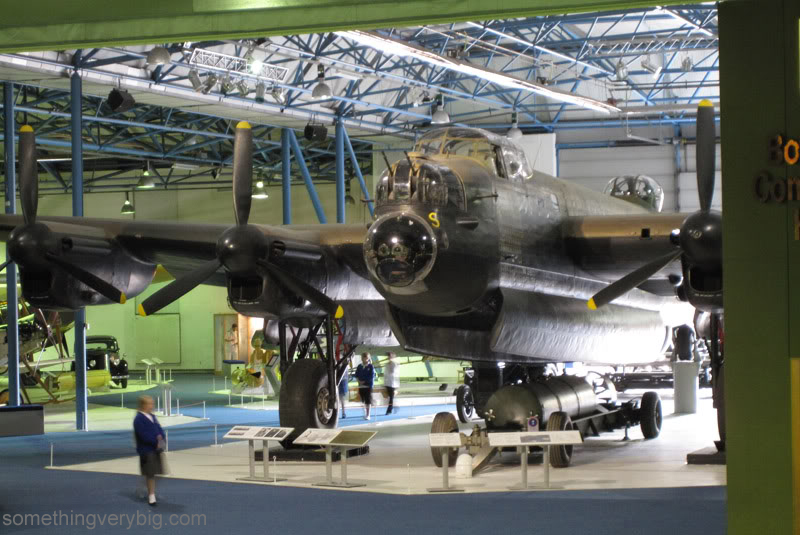 The Museum was doing work to their Bomber Command exhibition and so half the hall was closed. I couldn’t even walk a full circuit around the Lancaster. One of my favourite things to do when in close proximity to a Lancaster is to just walk around it, looking up. I think it’s got something to do with realising how big the thing is. But I couldn’t do that on this day. I don’t know why, but Sugar just didn’t have the effect on me that I was expecting it to. I couldn’t walk all the way around the aeroplane. There was the sound of power tools over on the other side of the hall (the side that was closed off). There was the ‘beeping’ of a moving cherry picker. The atmosphere – that I think the Australian War Memorial has captured with their Striking by Night display using G-George in Canberra – just wasn’t there. I realise that here was an aeroplane that was at Waddington when Jack’s crew were there – it was even on the same operation to Lille from which they failed to return. But I found nothing there. The collection of metal bits and pieces looked like a Lancaster but I detected none of the ‘something else’ that I found at Canberra. It just wasn’t there for me. S for Sugar was a bit disappointing. One aeroplane that definitely still has that something special is PA474. Unique amongst those Lancasters that I’ve laid eyes on, this one still flies. I spent three weeks on the Bomber Command trail in Lincolnshire last year. Despite chasing it half way across the county, I failed on that occasion to see City of Lincoln in the air. There was no way it was going to beat me this time around! The anticipation began to build. The airshow was fantastic. All sorts of aeroplanes that we just can’t see in Australia, displayed in professional and entertaining ways. The large crowd lapped it up. In the afternoon, England was playing Germany in the game that would ultimately send the Poms home from the World Cup. The airshow organisers had thoughtfully provided a few very big video screens on which to show the match. 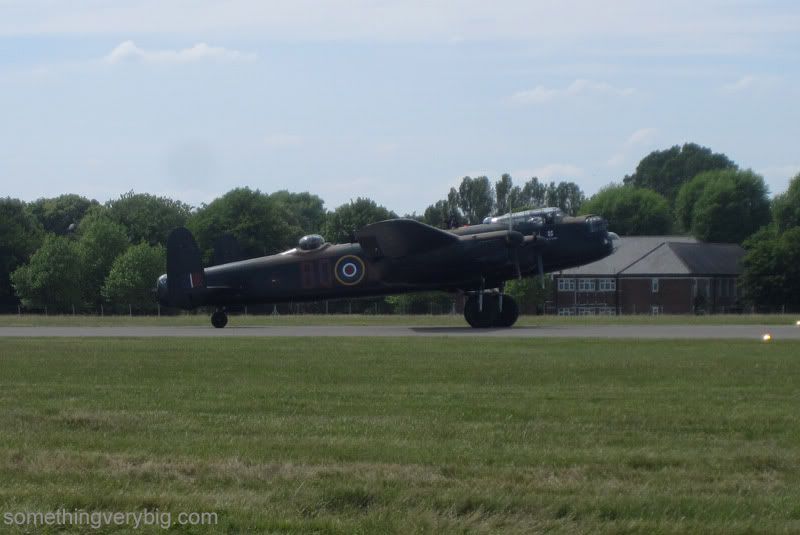 The Lancaster started up and taxied out shortly after kick-off. 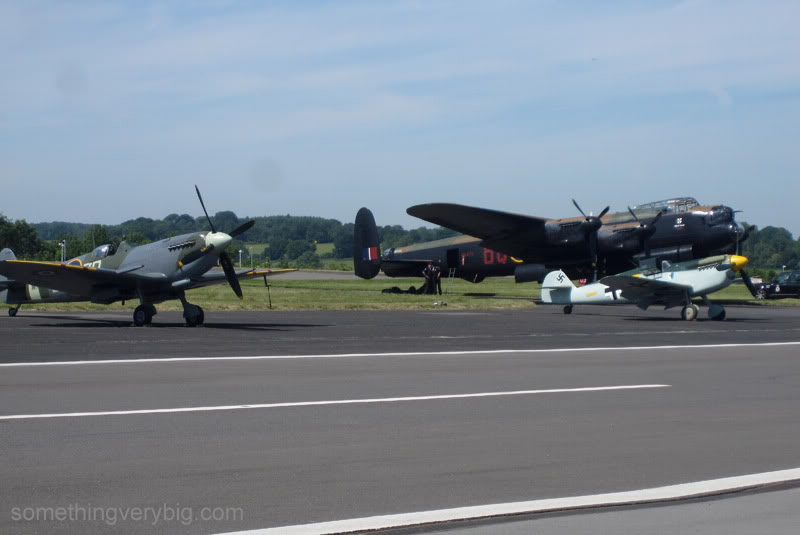 Every person on that airfield had their eyes glued to the old bomber. The football never stood a chance. There is something about the sound of a Lancaster at take-off power. You can’t look away (even if a contentious refereeing decision just cost England any chance they might have had of reaching the next round). The aeroplane made several low, slow passes with the grace of a beautiful lady in her element, the Merlins purring as she swept past. That silhouette is unmistakeable. The crowd’s attention was wandering back towards the football after the Lancaster made its final pass. I kept watching though, as it headed into the distance. The wings became stumps, then they disappeared altogether and the aeroplane became but a dot. I was still watching as the dot disappeared over the horizon, the throb of those engines finally fading away. A minute or two later I was still watching, still searching, but it was gone. 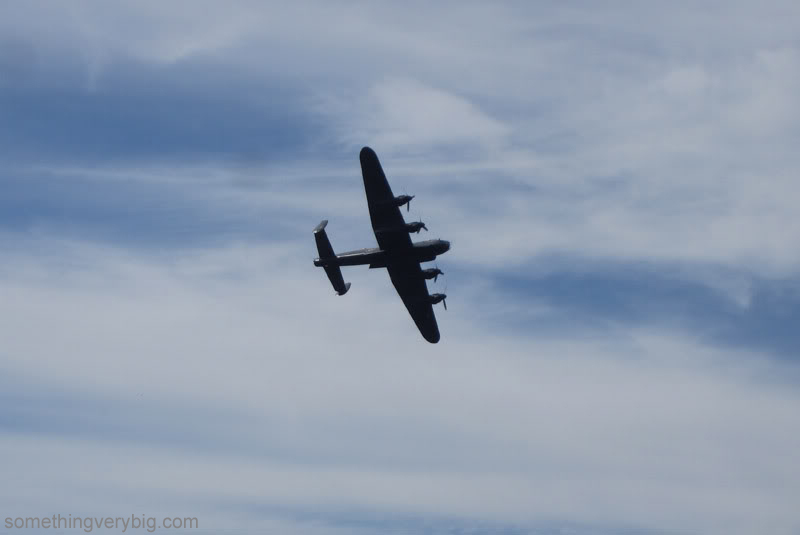 I’d travelled half-way across the world, and finally I’d managed to see a Lancaster in the air. Satisfied, I turned my attention to the big screen to watch the rest of the match. The crew are gaining some definition. There is even the hint of a ‘flare chute’ inside the door to the Lancaster. The saucepan shape of the dispersal pan is beginning to take shape. And you’ll see that the bicycle has arrived, leaning against some oil drums. The bike is an important part of the story. I have documentary evidence that at least Phil Smith and Gil Pate had bicycles that they acquired during their time at training units. The RAF bicycle was ubiquitous around airfields – used to get around the sprawling sites, where accommodation could be a couple of miles from the mess, the briefing room and of course the dispersals. A great pile of bicycles outside a pub in the nearby village was a sure sign that aircrew would be inside. There’s a personal connection as well – a bicycle has been my primary mode of transport around Sydney for the last five or six years, and my bike has come to define me almost as much as my flying does. So I thought a bicycle would be a nice personal touch to make the painting ‘mine’. It is now very close to completion – hopefully I’ll be able to pick up the finished painting when I drive to Sydney next weekend. -Clive Rattray, son of Lieutenant Kenneth Rattray, a Rat of Tobruk, on being handed his father’s wartime knife. From a story in the Sydney Morning Herald in October 2010 (link: http://www.smh.com.au/national/tobruk-knife-finds-way-home-20101016-16oat.html). The knife in question had been lost for nearly 70 years. Lt Rattray carried it – a simple pocket knife, engraved with his name and his service history – through the Siege of Tobruk, then through Bougainville and to Darwin in 1943, when it disappeared. It turned up in, of all places, an English cinema some years later. It then disappeared again, before being found in an old suitcase in Kent in the house of the cinema’s former usher. The family of the usher was intrigued by the inscription on the knife and set about tracing its real owner – until, finally, just a few weeks ago, the knife was returned to Lt Rattray’s son. It’s the story of the knife – seeing action in two major theatres of WWII, then its unlikely journey to England and its equally improbable return to Australia – that makes it so special. On its own, it’s ‘just another knife’, albeit one engraved with faint letters. But knowing its intriguing history somehow gives it extra meaning. It adds a human element to an otherwise unremarkable inanimate object. I was reminded of this story when I visited the Powerhouse Museum’s Discovery Centre in Castle Hill in north-west Sydney for one of their recent monthly Open Days. I went along and enjoyed a tour of the warehouse – an esoteric collection of fantastic and fascinating objects covering Australia’s technological history. Among the collections in the warehouse were a number of models of biplanes. They had been built, we were told by our guide, by a young man with a keen interest in aeronautics in the 1920s. The man later followed his dreams of flight, joined the RAF and flew fighters in WWII. He was shot down and disappeared over Crete. Many years later his son found some limited information about where his father was buried. He visited the island armed with only some bare facts – but he managed to find someone who was there when his father was shot down. Someone who, in fact, had sat with his father while he took his last breaths. It was a special moment for the son when the old man led him to the gravestone under which his father lay. A very special story, then. Knowing the story of the man who built them gives the models something extra. It raises them above the wood, wire and fabric of which they were built. Like the Tobruk knife, they are otherwise ordinary objects that become representative of something more. 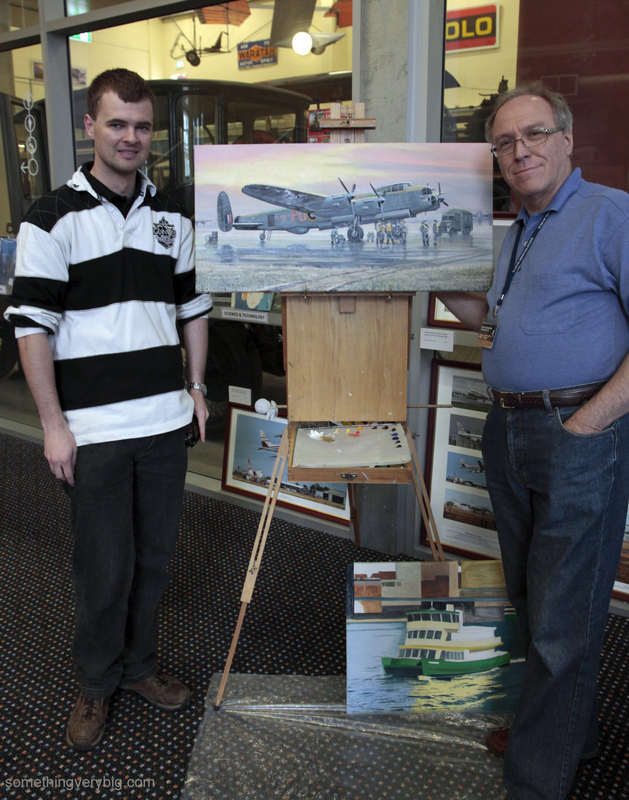 Encouragingly, Steve reported some good interest in the painting from some of the people who had wandered through. Some even asked about the possibility of getting a print of it. I was happy to hear that – it means that the story of B for Baker and her crew won’t be forgotten.